In London recently, I dropped by to see The Rosetta Stone at the British Museum. This slab of granodiorite is so famous that I could barely get near it for all the people craning over each other to take a close look. So why were all those people so eager to look at a big stone? And why is it so important? Weighing in at around three-quarters of a ton, the stone is approximately 118cm high, 77cm wide and 30cm deep. Discovered by Napoleon’s army in 1799, the Rosetta Stone is named after the place it was found – near el-Rashid (Rosetta) in present day Egypt. When Napoleon’s army was defeated, the stone became the property of the English, and has been on display in the British Museum since 1802 (although its presence is debated). The Rosetta Stone is inscribed with three columns of different languages – Greek, Demotic and hieroglyphics, which all have the same message. The inscription on the stone is a decree passed by a council of priests – but it’s not so much what is written that’s important (although it does tell us a lot), it’s what knowledge can be gained from the inscription. The decree is inscribed on the stone three times, in hieroglyphic (suitable for a priestly decree), demotic (the native script used for daily purposes), and Greek (the language of the administration). The importance of this to Egyptology is immense. Soon after the end of the fourth century AD, when hieroglyphs had gone out of use, the knowledge of how to read and write them disappeared. In the early years of the nineteenth century, some 1400 years later, scholars were able to use the Greek inscription on this stone as the key to decipher them. 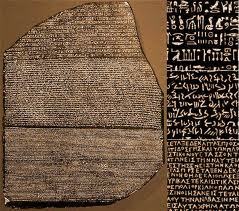 Thomas Young, an English physicist, was the first to show that some of the hieroglyphs on the Rosetta Stone wrote the sounds of a royal name, that of Ptolemy. The French scholar Jean-François Champollion then realized that hieroglyphs recorded the sound of the Egyptian language and laid the foundations of our knowledge of ancient Egyptian language and culture. Its importance is highlighted with the Rosetta Project, which I will be looking at in my next post…. You are currently browsing the archives for the Demotic category.